Current auto loan rates are displayed beneath the calculator. When you change any input this calculator will automatically compute a loan's payment amount based on the principal amount borrowed, the length of the loan and the annual interest rate. Click on the "Create Amortization Schedule" button to create an amortization report you can print out. While this calculator was originally designed for vehicle loans, you can use it for any type of loan. For personal loans set the downpayment to $0. If you wanted to use this calculator for home mortgages, please keep in mind the amortization tables & payment amounts will only reflect the principal and interest on the loan. Other expenses like PMI, homeowner's insurance, HOA fees and property taxes are not included so as to not confuse anyone who came to this page specifically seeking an automotive amortization calculator. You can optionally enter depreciation information to estimate how much a vehicle might be worth at the end of a loan term. For a home - or another asset type that is likely to appreciate rather than depreciate - you can enter a negative number for the rate of depreciation to estimate how much it will appreciate over time. For example, if you thought a home was likely to appreciate at about 5% per year you would enter -5 in the depreciation fields. While this calculator allows people to estimate the cost of interest and depreciation, other costs of vehicle ownership like licensing, fueling, repairs & automotive insurance are not included. As a good rule of thumb repairs tend to run close to $100 or so per month on average, though it can vary significantly based on the vehicle's age and how it is driven. When they are secured using credit, the total purchase prices of big-ticket items are repaid over time, with interest added. Payment amounts and the duration of each billing cycle are unique to each loan, tied to a host of variables impacting repayment. Major purchases, like real estate and cars, are financed using installment credit, which furnishes consistent repayment schedules and amounts. These purchases are long-term investments, requiring years to pay-off, so installment credit allows borrowers to forecast payment responsibilities accurately. Car loan amortization calculator harnesses all the factors influencing borrowing and repaying car loans, distilling your loan's payment amount at various intervals. Loan repayment is subject to terms and conditions agreed upon by lenders and borrowers as loans originate. The amount of each payment, the length of the repayment term, and the interest percentage applied to the loan represent the basis for car loan repayment schedules, which consumers use to budget for future purchases. Loans are structured in different ways, each carrying distinct advantages for lenders and debtors. Balloon loans, for example, require interest only payments for a particular term, before the entire loan principal balance comes due. Because a large part of the financing comes due all at once, toward the end of a loan period, balloon or bullet loans are very risky to lenders. It is just too easy for borrowers to limp along with interest payments, only to falter when the mother lode comes due. To limit risk and help borrowers budget for payments; mortgages, car financing, and other high-dollar loans are amortized, or spread out, over the course of long-term repayment. Amortized payments are associated with the original sum borrowed, or principal amount. The amount to be repaid is broken into manageable chunks, due each billing period. Interest is then added to each amortized principle payment, comprising the total required payment for each billing period. Interest and amortized principal operate on different schedules, so additional measures are required to keep payment amounts balanced over the life of a loan. Early payments on mortgages and other installment credit, for example, include higher portions of interest than those falling closer to the end of a loan's life. As the final payments near, the amount of each payment applied to the original principal balance grows, while the interest amount charged during each billing cycle declines. Payments remain the same, they are just split-up differently. 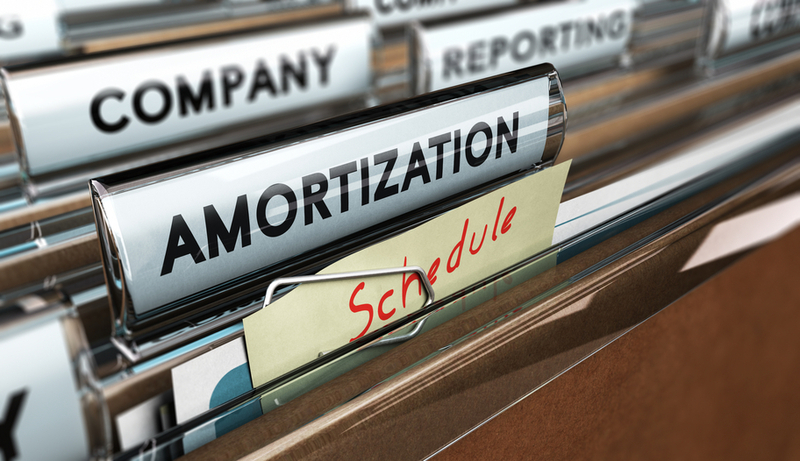 Car amortization schedule uses inputs like down payment amount, loan term, and interest rate to help identify exactly what your car payments are, or will be. Interest is expressed as an annual percentage rate (APR) to be applied to the original loan balance. By keeping other terms equal, it is easy to see how APR influences each month's payment. Amortization calculations also use the type of payments you make to determine where you stand on car loan amortization. Monthly payments, for example, provide one set of payment obligations, while bi-weekly payments alter the structure of repayment schedules significantly. Once created, amortization schedules hold true until one or more of the variables used to create them changes. This table is for reference only, please use the above calculator to create a printable version of your loan's amortization schedule.